See Syria Special: No “Strategic Victory” — What Does Russia Do Now? 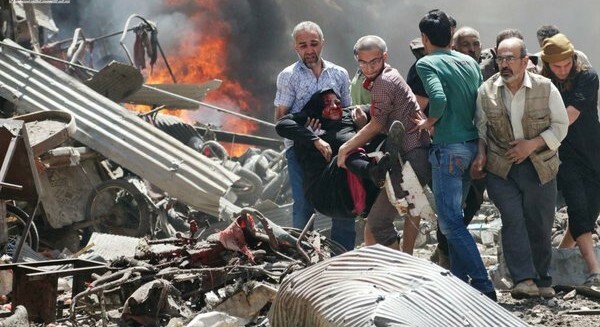 The Assad regime bombed towns in Idlib Province on Tuesday, killing more than 50 people and wounding more than 100. In Maarat al-Num’an, a bomb on a vegetable market killed at least 30 people, while an attack on Kafranbel left at least 18 dead. The Assad regime has carried out numerous attacks since a February 27 cessation of hostilities, brokered by the US and Russia, but Tuesday’s assault pointed to the final breakdown of any ceasefire in the northwest. The bombing came 24 hours after rebels and the jihadists of Jabhat al-Nusra and Jund al-Aqsa advanced in Latakia and Hama Provinces following gains of territory earlier this month south of Aleppo city. There was no sign on Tuesday of Russian warplanes, who had enabled regime-Iranian-Hezbollah ground attacks in the northwest since last October, joining the Syrian air force. The regime also bombed opposition-held areas in Aleppo city, killing at least 12 people. The Local Coordination Committees documented 108 deaths across Syria on Tuesday, including 52 in Idlib Province. Meanwhile, the opposition-rebel bloc reconfirmed that it is formally suspending involvement in the Geneva political talks. The coordinator of High Negotiations Committee, Riad Hijab, cited the regime’s bombing, blocking of humanitarian aid to besieged areas, and mass detentions, including of women and children. He asserted, “There can be no solution in Syria but to drop Bashar al-Assad”, bringing in a transitional governing authority with full executive powers. President Assad and the regime delegation have refused any negotiations which involve Assad’s future. Hijab called for support of Syria’s rebels with weapons, advising them to continue their fight until the fall of Assad. If they left the talks, the talks will not lose anything, because they do not represent the Syrian people to begin with. Quite the contrary; maybe by them leaving they will take away major obstacles and that will allow us to reach a solution, because these are a mix of extremists, terrorists, and mercenaries at the beck and call of the [Saudi royal] al-Saud family. Madaya has been blockaded by the Syrian military and Hezbollah since their offensive on nearby Zabadani last July. Despite a truce last September, the siege was maintained, with more than 70 people dying of starvation from December 1. The Assad regime only relenting and allowing limited aid in January. Despite the pleas of doctors and medical NGOs, the UN had been unable or unwilling to overcome the Assad regime’s prohibition on evacuations, leading to the deaths of several residents this month. Wednesday’s evacuation transferred the Madaya-area residents to opposition-held Idlib Province. Meanwhile, 250 people were moved from the regime enclaves of Kafraya and al-Fu’ah, north of Idlib city. Both pro-Kurdish and pro-regime activists are reporting new clashes between Kurdish police and regime forces in mainly-Kurdish Qamishli in northeast Syria. A pro-regime activist says eight pro-Assad National Defense Forces have been killed. He says that six Kurdish police are dead and 14 wounded, and four civilians have been slain. There have been recurrent skirmishes between the two sides in their positions in the city, near the Turkish and Iraqi borders. The latest fighting was reportedly sparked the arrest of an NDF commander by the Kurdish police, the Asayish. When the NDF detained several Asayish, the police opened fire on the militia. The Assad regime’s UN ambassador has accused European intelligence services of helping “terrorists” reach Syria and Iraq. If these states really wanted to stop the terrorists striking Syria and Iraq, they would have forbidden the flow of these terrorists from their countries. For every terrorist who has come to us, his government is responsible…. It’s hard to believe that a terrorist who leaves Paris, London, Brussels, or Boston, or Australia and arrives in Syria without a visa, without a passport, through dozens of states and the Turkish-Syrian or Jordanian-Syrian border, has done so without intelligence services overseeing these operations. US officials say Russia is moving artillery units to fronts in the northwest, including areas where rebels and Jabhat al-Nusra have advanced and where pro-Assad forces are hoping to cut off opposition supply routes. Speaking to The Wall Street Journal, the officials also spoke of Iran’s initial deployment of army units alongside Revolutionary Guards, Hezbollah, and Iranian-led foreign militia. The White House said US concerns about the Russian buildup prompted President Obama’s call to Russian counterpart Vladimir Putin on Monday, officials said. Press Secretary Josh Earnest said the two leaders had an “intense conversation”. US officials said intelligence services tracked the deployment of artillery, manned by Russian troops, and Moscow’s advisors in the Syrian military’s capture of Palmyra in central Syria from the islamic State last month. Two weeks ago, the artillery units began to redeploy near Aleppo city and in Latakia Province. The Russian artillery movements have increased in recent days, an official said. Rebels and Jabhat al-Nusra regained territory south of Aleppo city at the start of April. On Monday, rebels, Jabhat al-Nusra, and the jihadists of Jund al-Aqsa launched operations in Latakia and Hama Provinces. The head of Syria’s civil defense organization, the White Helmets, has been denied entry by the US, according to an alliance of NGOs giving him an award. Saleh was being recognized by InterAction for his leadership of more than than 2,800 volunteers who are credited with saving tens of thousands of lives in the conflict. “I am shocked and saddened to learn that Raed would be turned away by US officials on the eve of being recognized by his peers in the international humanitarian community for his heroic work in Syria to help bring life-saving assistance to communities under fire in Syria,” said InterAction CEO Sam Worthington. Saleh had previously traveled to New York in June 2015 to address the UN Security Council. PreviousSyria Special: No “Strategic Victory” — What Does Russia Do Now?